Advances in technology have led to the emergence of new forms of crime, and have enabled other crimes to move online, changing their nature and impact on victims and communities. The same technological change has generated new opportunities for the police, at a time of increasing focus on efficiency and innovation. Against this backdrop, there remains a complex relationship between public expectations of the police and the operational realities of modern-day policing. The changing nature and challenges of policing in modern society has prompted processes of reflection by many Governments and public authorities internationally in recent years, including in the UK, where a Parliamentary inquiry was established in March 2017 to examine whether police forces in England and Wales are sufficiently equipped and resourced to keep the public safe and to respond effectively to evolving demands and changing patterns of crime. All this, too, takes place in the context of a much-needed renewal of how criminal justice policy is formed. The Commission on the Future of Policing in Ireland was established by the Government in May 2017 with a similar remit, given that like all police services An Garda Síochána faces internal and external challenges rooted in the changing context in which policing operates in the 21st century. However, the establishment of the Commission also took place in a context of added complexity and political intensity here in Ireland, where An Garda Síochána has been the subject of significant public controversies over the past decade. The Commission’s mandate is therefore to carry out a fundamental review of the role, structures, leadership and management, ethos and culture of policing and existing oversight and consultative arrangements and to develop a blueprint for the future of policing in Ireland. The Commission will report in September 2018. 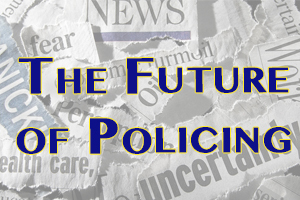 With the stakes so high for the success of this work, Behind The Headlines - The Future of Policing, will step back from the day-to-day challenges and controversies being reported in the media on a daily basis and reflect on the wider context and drivers of reform in policing, including the impact of technological and organisational innovation. Kathleen O’Toole will reflect on the role of the Commission on the Future of Policing in Ireland as a vehicle for policing reform. Ms O’ Toole is a career police officer and lawyer who rose through the ranks of policing in the United States. She has served as Chief of the Seattle Police Department, as Boston Police Commissioner and as the first Chief Inspector of the Garda Síochána Inspectorate. She is Chair of the Commission on the Future of Policing in Ireland. Antonio M. Oftelie will focus on how technology and innovation can shape the future of policing. Dr Oftelie is Executive Director, Leadership for a Networked World and Fellow, Technology and Entrepreneurship Center at Harvard University. He is an expert on how law, policy and technology can be aligned to create exceptional environments for organizational innovation and adaptation. He is also a member of the Commission on the Future of Policing in Ireland. Mary Rogan will examine how the changes seen within policing are part of a much-needed and overdue pattern within criminal justice policy of increasing attention on long-term and strategic planning. As Professor of Law at Trinity College Dublin, Mary Rogan leads a project funded by the European Research Council on the oversight of prisons, and is the Chairperson of the Implementation and Oversight Group on reforms to penal policy which reports to the Minister for Justice and Equality. Eunan O’Halpin will reflect on the history of the Garda Síochána since its foundation as the national police force in 1923. Professor O’Halpin is Professor of Contemporary Irish History at Trinity College Dublin. His research interests include Irish and British 20th century political and administrative history and international relations, with particular reference to intelligence and terrorism in the twentieth century.